Add a splash of style and color to any room by coming to our store for quality, name-brand paint. At our flooring store, we carry paint brands that you’ve come to know and love. Whether you want neutral tones, textured paint, or bright colorful hues, we have the perfect shade and style at our store. From flat finish paint to eggshell finish paint, we truly cater to your painting preferences and personality. Color your world the right way. If you use off-brand paint products, you may not like the result. We want you to improve the look of your rooms – not detract from them. By using trusted paint brands, such PPG Pittsburg® and PPG Pitt-Tech® paints, you avoid problems like paint peeling and fading. The brands we carry are high-quality products that last. In addition, they come in many different colors so you are able to match your design preference perfectly. At the same time, you don’t have to settle for just a few colors? At our store, we have thousands of variations to suit your needs. Get creative in your home and add some color to your life. These quality paints are easy to maintain as well. Simply wipe clean when necessary. Nothing should stand in the way of the color you want. Make it personal by getting imaginative with your interior paints. You may need a neutral tone that is the perfect backdrop for your home décor. However, a vividly colored paint could brighten things up a bit. Whatever you want is your choice. Perhaps you need a mint green finish in the bathroom or beige eggshell finish paint in your living room. Let us know what you’re envisioning, and we’ll help you find the perfect paint for your project. Depending on your personal preference and the location of the room you’re painting – bathroom, kitchen, living room, or foyer – your interior paint should have a specific finish. If the wall surface is somewhat flawed or uneven, then flat finish paint is an excellent option. However, for bathroom and moisture-prone areas, we recommend semi-gloss pant. This prevents any water from penetrating the surface. For most rooms, property owners generally prefer eggshell finish paint or satin finish paint. But the choice is all yours. We’ll be happy to discuss your needs with you. Simply stop by our store today for design assistance. 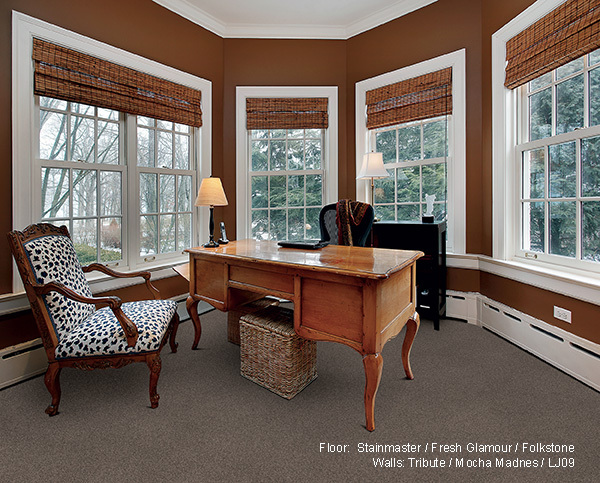 Our paint experts can advise you on the right finish based on your style and color choice. It’s hard to get creative when you don’t have any inspiration. Get off the couch and stop by our store. We not only have a huge selection of paint brands, but our sales associates can help you get inspired. Bring in photos and color samples, and we’ll sit down with you to help you choose a color that brings your vision to life. Contact us to see how we can enhance your living areas with quality paint. We proudly serve customers throughout St. Paul, Bonnyville, Fork Lake, Lafond, and Elk Point, Alberta.